that let you easily create beautiful surveys—and today’s updates give you even more ways to build and share those surveys. 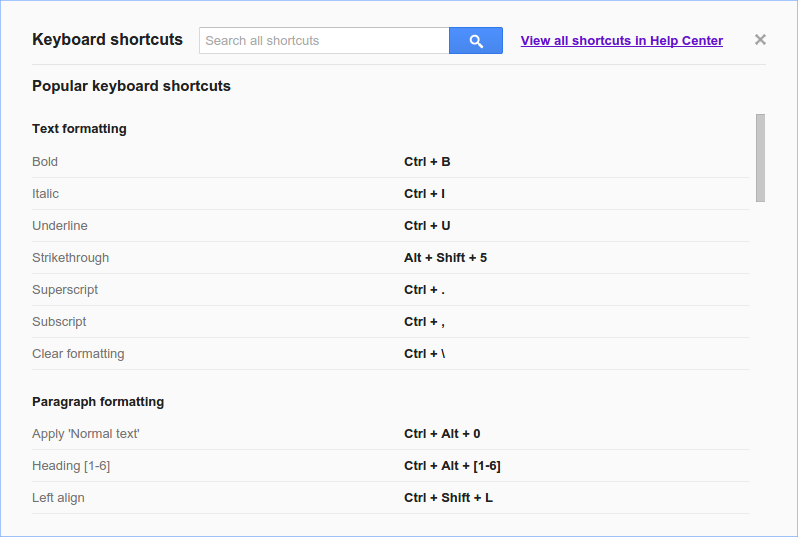 Similar to Docs and Slides, you can use the “Search the menus” shortcut to get quick access to nearly all the features in Forms, without having to dig through the different menus at the top of the page. 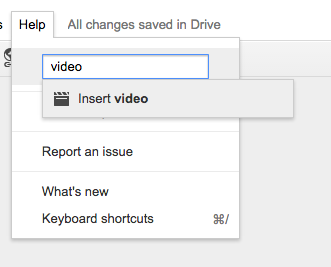 To find a feature, simply press Alt+/ or look under the Help menu. mix things up by randomizing the order of questions on quizzes or surveys with the new “shuffle questions” option. make sure you only get one answer per person by turning on the “only allow one response per user” feature in settings. And of course, what’s the point of creating a survey is you can’t share it with others? 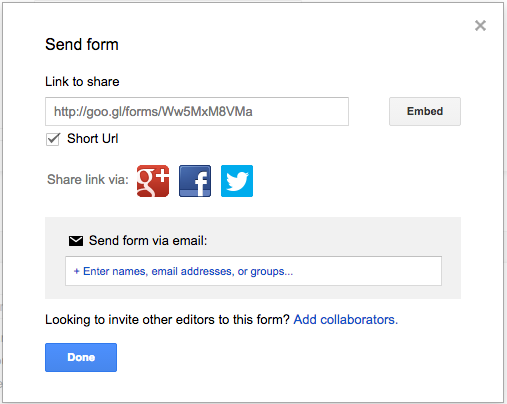 To make this easier, now when you click the “Send form” button, you’ll see a checkbox for creating a tidy URL to share. 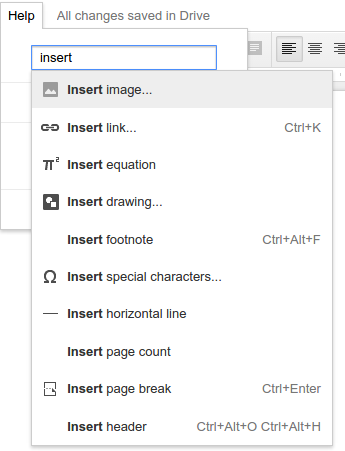 Learn more about all the ways you can use Google Forms at google.com/forms/about and stay tuned to our +page and Twitter account to follow along with the latest updates for all the Docs editors. Earlier this month, Google Forms got snazzed up with new customizable and pre-designed themes that let you easily create beautiful surveys—and today’s updates give you even more ways to build and share those surveys. Sharing just got a little easier. Today we’re introducing a new sharing experience that makes it easier and faster to invite others to access your files. Like always, just click the big, blue “Share” button at the top of an open file, or if you are in your Drive list, you can now click the person icon at the top of the page after you’ve selected one or more files. A box will pop up, and from there, you can add individual people to share with directly. 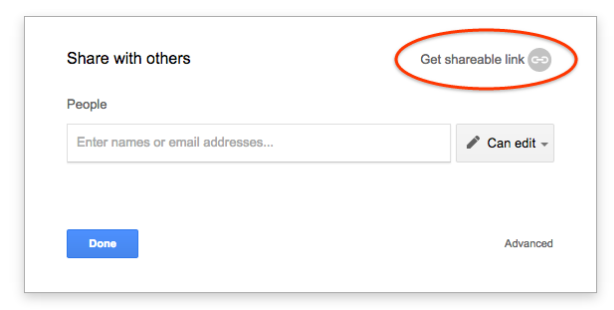 But as a new addition, if you want to create a unique shareable link, you can now just click the “Get shareable link” button. The shareable link will be set to view-only by default. And if you are ever wondering whether you’ve already made the link shareable, just look at the icon next to the button. Green means yes, grey means no, just like on your Android device. If you want anyone with the link to be able to do more with your file, like leave comments and suggestions or make edits, just change “can view” to “can comment” or “can edit” in the dropdown. Check your accounts for these updates over the coming days. One of the perks of using Docs, Sheets, and Slides—along with any other file types you’ve saved in Drive—is that you can invite others to view, edit, or comment on any file or folder you choose. and click the “Change theme” button in the toolbar. From there, you can add your own photos or logos to the header, customize fonts and colors, pick a background, and more. If you don’t want to use one of your own images, you can also choose from tons of brand new themes, like the ones shown below. 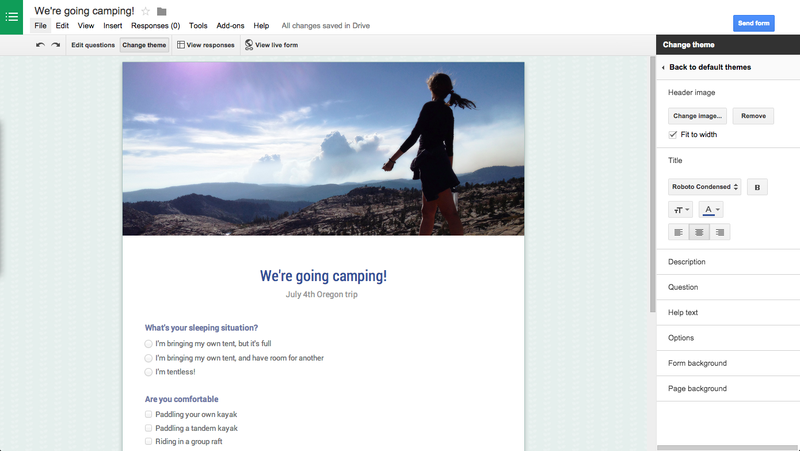 Google Forms makes it easy to gather information from a group, whether it’s something as important as requesting RSVPs for your rehearsal dinner, collecting attendance from students for a class trip, or just keeping track of who’s bringing what on a camping weekend with your friends. To add a custom theme, just create a new form and click the “Change theme” button in the toolbar.